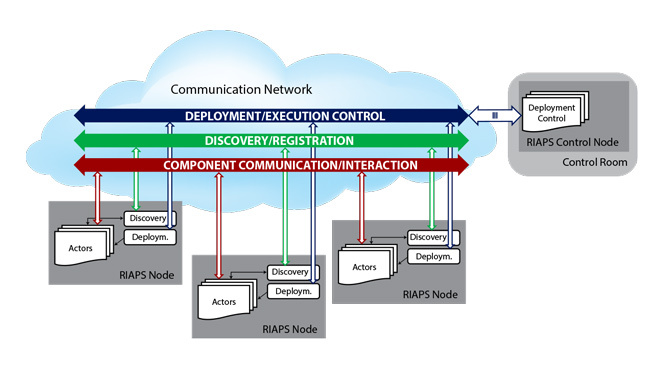 RIAPS is a Resilient Middleware for Smart Grids. See riaps.isis.vanderbilt.edu for more information. Welcome to the RIAPS documentation! RIAPS is a software platform for building distributed real-time embedded applications using a component-oriented approach. Our application area is power systems - the ‘Smart Grid’ where RIAPS can serve as the foundation for implementing the distributed intelligence. The original project website is located at: https://riaps.isis.vanderbilt.edu The website has some technical background information about the project, as well as academic papers and recorded demonstrations. The information, data, or work presented herein was funded in part by the Advanced Research Projects Agency-Energy (ARPA-E), U.S. Department of Energy, under Award Number DE-AR0000666. The views and opinions of authors expressed herein do not necessarily state or reflect those of the United States Government or any agency thereof. Credit is due to the developers of the open source packages RIAPS is built on. The core list includes: Zeromq and its related packages, Eclipse, Python, and, most fundamentally, Linux.